From Croyde follow the signs to Pustborough Beach. It is a narrow lane so beware of oncoming traffic. Approximately 500ft before the turning down to Putsborough Beach there is a metal gate on the Westerly side of the road. ( see E on map) Access to take off with a vehicle is through this gate. Please ensure that you close the gate upon entering and leaving. Follow the track that runs adjacent to the wall and park your vehicle at the point where the wall turns 90 degrees south. (see P on map). This ensures it is out of view from the public on the beach. Parking is strictly limited to members and temporary members only. For those wishing to use the beach before or after flying then please use this facility. There is a public toilet, café and a phone in the office in case of emergency. It is a 5 minute walk up the hill to take off from here by following the North Devon Coastal Path. See map for all locations and side notes in this guide. Putsborough is a coastal cliff site and therefore we recommend you rig behind take off. The take-off area is marked with a U on the map. Please treat this site as a Cliff Launch – recommended that you have previous cliff launch experience. For Hang Gliders a Nose Man may be required. There are lots of landing areas in the fields behind launch. Be aware of potential rotor close to the cliff itself. Hang Gliders are recommended to land further back to avoid rotor. NOTE – This is a coastal site – at High Tide there is NO BOTTOM LANDING. Ensure you have judged the conditions properly and when possible launch when the sea is not at high tide so you have a bottom landing option on the beach below. Please be aware in the summer the beach can be busy so ensure you give members of the public plenty of room and notice of your landing intentions. Putsborough is a coastal ridge soaring site. 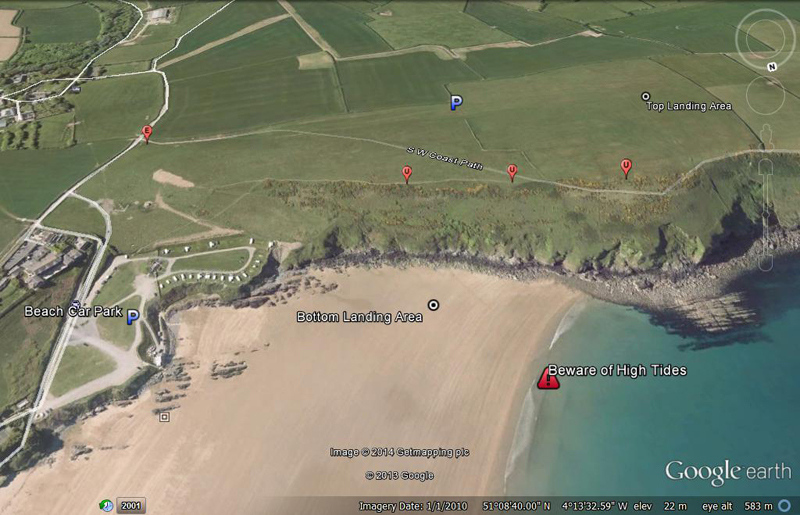 To the south of launch is Croyde Bay therefore we do not recommend you fly downwind of the site. It can provide great ridge soaring along the coast to Baggy Point which is approximately 2kms to the west of launch. However, note THERE IS NO BOTTOM LANDING. If in doubt top land in the fields that follow the cliff site. Hang Gliders give yourself plenty of height to set-up properly for a top landing. Paragliders side landings are limited so the same advice would be suggested. HIGH TIDE – NO BOTTOM LANDING! Judge the conditions – advisable to launch when tide is out. All Pilots should be extremely cautious when flying a sea breeze. Note that at the end of the day it can switch off suddenly which results in extreme sink on the site! NO POTENTIAL TO GO DOWN WIND – There is a beach and bay 1km south of launch – ensure you do not fly in strong winds otherwise there is the potential to get blown over the back towards the bay. NORTH DEVON COASTAL PATH – Please be aware that the launch site is very close to the coastal path and there are walkers who frequent this area. If the search and rescue Helicopter repeatedly flies over and close to the site then a rescue is in progress and all pilots should land immediately. A large L will be displayed on takeoff and/ or a fog horn sounded but should this for some reason not happen all pilots must land anyway. Acro, or radical manoeuvres are strictly prohibited if you are within 500 feet of any other person, in the air or on the ground. This is in accordance with the Air Navigation Order, (ANO CAP 393, sec 2, page 6, March 2007). Any manoeuvre which, if it went wrong and could contravene the above rule, is also prohibited. An example of this is: A deep spiral directly over other persons, but greater than 500 feet away, that, if it became unrecoverable could impact those below. If you are intending to travel and fly at Putsborough, please ensure you call the Low Flying Booking to register at CANP before 8pm the evening before. 0800 515 544. There is a local Air Sea Rescue Helicopter that regularly covers this area so a CANP is mandatory.